Our coated steel X-Base is the best way to display your feather flag, swooper flag or teardrop flag on any hard surface (parking lot, sidewalk, compacted soil). 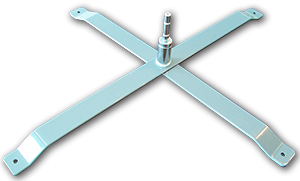 The X-Base features a dual sealed bearing center mount that allows the flag and pole to smoothly swivel in the wind. This is key to keeping your flag from wrapping around the pole and keeping your message visible. The combo includes the fillable water bag to add up to 23 pounds of weight for added stability. The X-base & Water Bag Combo mount. A must for use with our large feather flag poles and a great idea for any size flag when the wind picks up. Note: Water bag is pictured installed over X-base.